Tencent launched Rhythm Master, a VOS-like (virtual orchestra studio) game, on both QQ Mobile and WeChat platforms today (report in Chinese). Rhythm Master is a stripped-down version of the PC-based QQ Dancing, a VOS-like 3D dancing game previously released by Tencent in 2008. Both of the two modes of the game introduced score ranking function. Users can share scores to their friends in the stage mode, while free mode enables gamers to check the scores of all gamers playing the same song. Rhythm Master added a new feature, enabling gamers to buy songs in a game shop. The songs are now priced at 6 yuan each. Other features of Rhythm Master are similar to Link Link and We Love Pang, users can gain more playing time by interacting with friends and virtual currency is available for purchasing gaming tools to achieve higher scores. 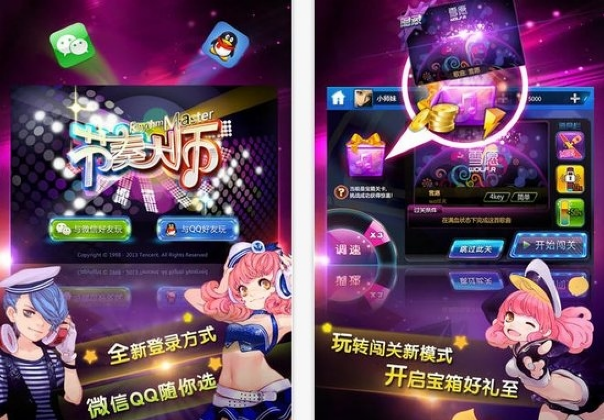 After the launch of Rhythm Master, the number of games on QQ Mobile and WeChat game centers amounted to three and four, respectively.